Yes, Dao also means way. And Jesus, in John, said, “I am the light and the way.” But Chinese and Western cultures have often interpreted salvation differently. This church that I saw in Dali, Yunnan blends Chinese and Western art forms. 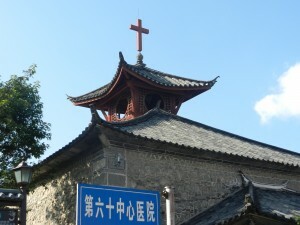 The growth of Christianity in China is a fascinating cultural crossroads. A Chinese friend told me that he’s sometimes uncomfortable with Christianity because of its focus on absolutes. He feels more at home in traditional Chinese ideas of the universe as a harmonious blend of many spirits and energies, which mirrors the human realm. For him, the way to salvation is a balanced life in line with them. But that’s not how a Chinese pastor in Silicon Valley sees it. He became a Christian because the Bible “declares”. It doesn’t argue–it reveals God’s truths. And Jesus’ universal love is the main truth. I pointed out China’s traumas from the early 19th century to the 1970’s, and today’s rough-and-tumble business world–they eroded many people’s faith in nature’s and society’s harmony. “That’s secondary” he declared. 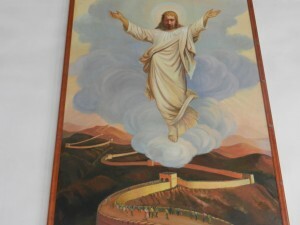 The above photo is a very powerful message: Jesus rises over the most famous icon of China’s past glories. Maybe the pastor’s right. I met a young Italian man in Chengdu who found Chinese Christians much more studious than Italians. He said that because Italians grew up in the Church, they attend it without thinking about it. 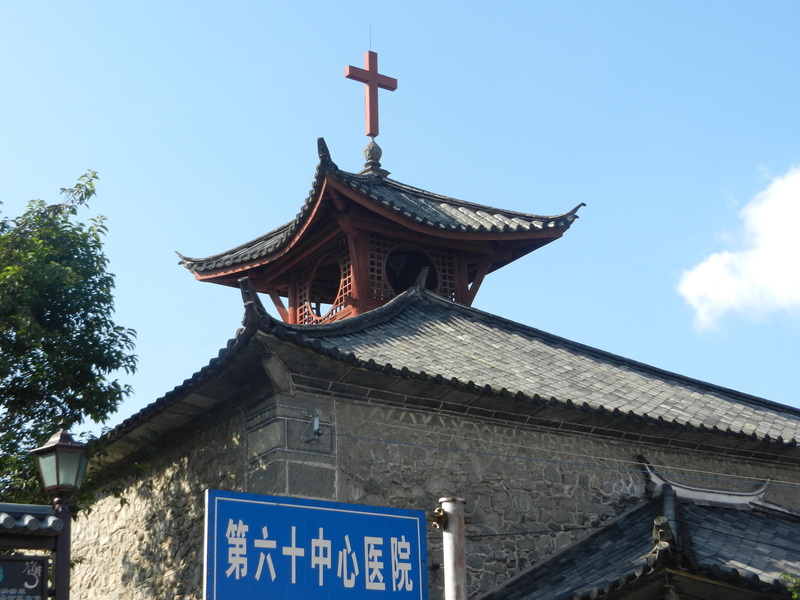 But Chinese Christians are more serious about their faith’s deep issues, and they study the Bible and its implications. The San Jose pastor invited me to his church. He’s usually very casual, but he wore a dark suit and sermonized for a longer time than I was used to when I grew up as a Catholic boy. 1. The sermon was about the Resurrection, and it compared Jesus’ earthly family with Christiandom’s universal family. The family’s continuity over the generations has been a dominant Chinese concept, and it’s central in Confucianism. So the pastor was introducing Chinese people to Christian values in their traditional terms. 2. Look closely at that picture of Jesus over the Great Wall–the clouds he’s enveloped in resemble Chinese landscape paintings, and cloud patterns from bronzes from the Shang Dynasty, which flourished more than 1,000 years before Christ. 3. Chinese value studiousness in general–it’s a Confucian tradition. 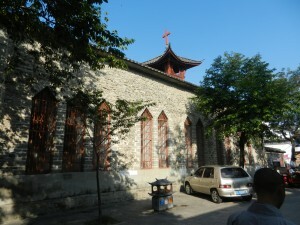 The architecture of the church in Ping Yao (above) expresses steadfast faith. Its design appeals to both Confucians and European and American Protestants. So is Christianity being seen through Chinese lenses, or is Christ’s universal love penetrating hearts and rising above all cultures like Jesus over the Great Wall? 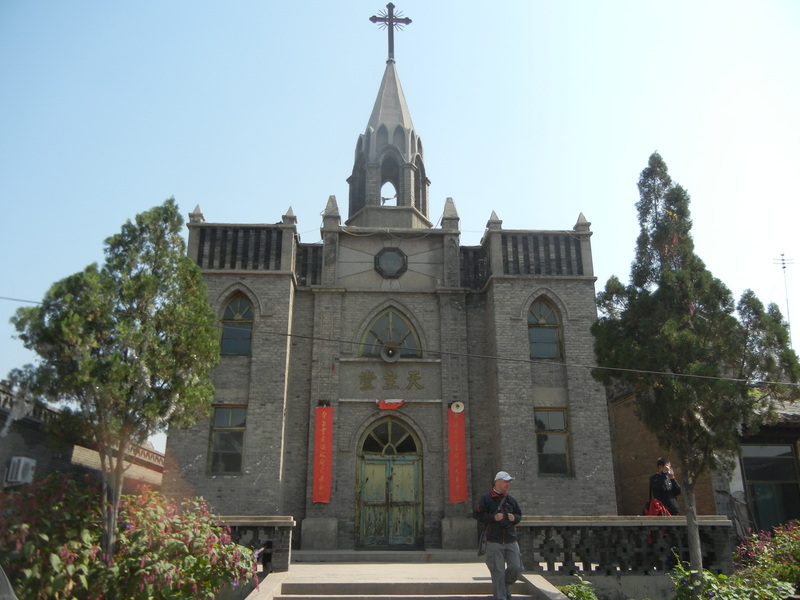 Chinese culture and Christianity are rich enough to have many meeting points, and to accommodate many personalities. Both have a creative future with each other, and the ways they intersect will be fascinating to watch.